San Vicente Hybrid tomato was a taste test winner in our tomato trials. 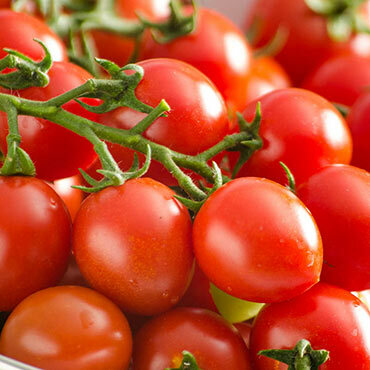 Its sweet, rich, intense tomato flavor has just the right balance of acidity and is perfect for fresh eating or tossing into salads. Attractive plant is high-yielding and has very little to no disease problems. Vibrant red fruit is crack- and blemish-free and holds well both on and off the vine. Indeterminate. 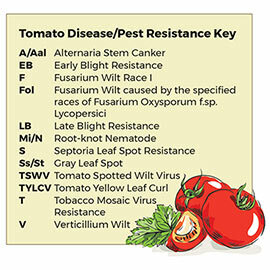 Disease resistance: VFF. 65 days to maturity. Depth: Seeds - 1/4 inch deep. When transplanting, set the plant deep, up to the first true leaves, by digging a deep hole or trench. The stem will develop roots along its length. Fruit: Brilliant red grape tomato, 1 to 1 1/2 ounces.